The sound of a ukulele quickly conjures images of floral print shirts, coconut-flavored drinks and the crash of the Hawaiian surf. Which is the complete opposite picture of a central Pennsylvanian winter. Nevertheless, the ukulele flourishes no matter the climate. 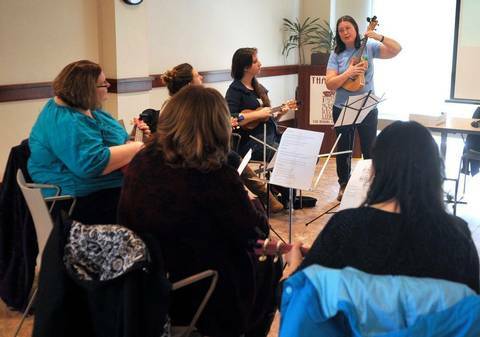 The small, four-stringed instrument will soon be available at four Centre County libraries thanks to the initiative of the Allegheny Ukulele Kollective, an Altoona-based ukulele club. The Kollective is seeking to make the instruments available to 32 regional libraries. The Ukulele Orchestra of Great Britain has undoubtedly influenced musicians worldwide to assemble and perform, and two central Pennsylvania clubs—Allegheny Ukulele Kollective and PSUkulele—are in on the action. The Allegheny Ukulele Kollective was honored to receive a grant from the Pennsylvania Council on the Arts & the Pennsylvania Rural Arts Alliance to expand our Lending Library Program. Kaleidoscope The Series is a 30 minute weekly news magazine covering west-central Pennsylvania and beyond. Kaleidoscope features a person, place and thing each week. Each week you’ll learn about an interesting person in the area with a unique trade, skill or is just doing more than his or her part in their community. We will take you to an interesting place to visit... sometimes with a catchy tune, that may just be at your back door, but you never knew it! From the moon rover, wind mills, honey bees and so much more; a different “thing” each week will surprise and excite you! Kaleidoscope The Series can be seen Sundays at 11:30AM AND at 6:00 PM on WATM ABC 23. This week on Kaleidoscope: We call some turkey, pedal for charity and we bring a small piece of Hawaii to Pennsylvania! Hallelujah from the Allegheny Ukes! You can jam with the Allegheny Ukulele Kollective this weekend, but today you can hear part of the group on our show! Mele Kalikimaka from the Allegheny Ukes! The Allegheny Ukulele Kollective shares their rendition of “Mele Kalikimaka” on Central PA Live! Enjoy! 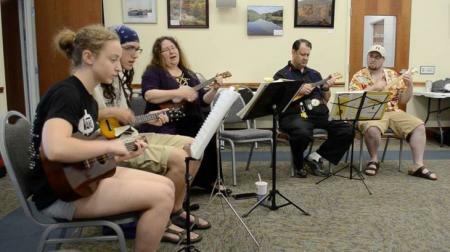 The Allegheny Ukulele Kollective is a ukulele enthusiast club based in Altoona. The Uke & Yule: A Ukulele Christmas Concert is happening at the Hollidaysburg First Presbyterian Church on Saturday, December 13 at 7:00 pm. The concert will feature all your favorite Christmas songs played on the ukulele! After the concert, try out the instrument for yourself. A $5 donation will benefit the Allegheny Ukulele Soiree. As part of our occasional series, Pennsylvania Music Makers, WPSU’s Kristine Allen visits a group of folks in Altoona who get a lot of joy out of four little strings. Steve, Mike, and a bunch of our strummers were interviewed by Kristine Allen of WPSU during the January 2014 Uke jam. Be sure to listen! Ukuleles Unite! The Allegheny Ukulele Kollective Performs! The Allegheny Ukulele Kollective was started by a Penn State professor who wanted to give local ukulele players a chance to get together to learn and perform. On today's show, club member Mike Holzer joins us, along with several other members of the group, to talk about the club, the popularity of ukuleles and an upcoming event to celebrate the instrument. The Allegheny Ukes submitted this entry to the This Land is Your Land Project. The smell of the paper masks still burn my nostrils when I play this song. Enjoy!